Infants are extremely susceptible to colds. In fact, the Mayo Clinic states that most babies develop between eight and ten colds by the age of two. The common cold, an infection that affects the nose and throat, is caused by a virus such as coronavirus or rhinovirus. Common symptoms include runny nose, nasal congestion, sneezing and fever. Although a nuisance, many of your infant’s cold symptoms can be relieved right at home. 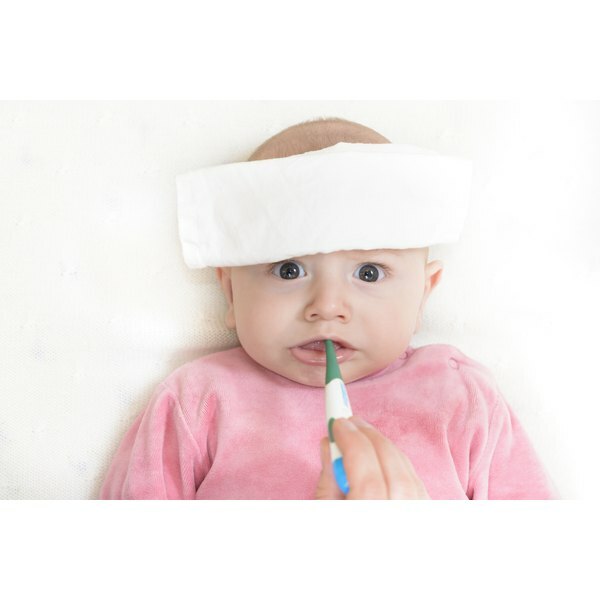 Give your baby acetaminophen to ease a fever associated with a cold. Follow the package directions for appropriate dosing. The Mayo Clinic states that ibuprofen is an acceptable alternative for babies older than 6 months of age. Squeeze a few drops of an over-the-counter saline solution into your infant’s nose. The BabyCenter website explains that this will help loosen up mucus and reduce stuffiness. Use a rubber bulb syringe to gently suction out the mucus. Run a humidifier in your baby’s room to help ease congestion and a runny nose. Just be sure to keep the mist aimed away from the crib so that baby’s bedding does not get damp. The Mayo Clinic recommends changing the water daily and cleansing the unit often to prevent mold build up. Apply a small amount of petroleum jelly to your baby’s nostrils if the delicate skin is irritated from excessive nose wiping. Elevate the top of your infant’s bed with a few towels tucked beneath the mattress. Sleeping with a slight incline can help ease postnasal drip, but be sure the incline is slight. Restless sleepers can flip in bed and end up on the wrong side of the crib, defeating the point of elevation. The Mayo Clinic explains that the best way to treat your baby’s cold is to prevent it in the first place. Always wash your hands before you feed or care for your baby. If soap is not available, use a hand sanitizer. Keep your infant away from sick people, especially during the beginning of the illness when it is most contagious. Teach the entire household how to sneeze or cough into a tissue or crook of the arm. The BabyCenter warns that you should seek medical attention if your baby’s cold symptoms are severe. If your baby is 3 months old or younger, immediately take him to the doctor if his fever is more than 100.4 degrees. No matter the age, seek a doctor’s advice if cold symptoms last for more than two weeks or include gasping or wheezing. These could be a sign of serious medical conditions such as respiratory syncytial virus (RSV) or pneumonia.